Uber in an update to its iOS app on Tuesday re-enabled Maps and Siri integrations that were inexplicably removed in January, suggesting the apparent error originated with the ride sharing app and not Apple's operating system. As seen in the screenshots above, Uber version version 3.284.10001 reinstates Maps extensions and Siri voice control integration lost with a previous iteration of the app last month. Prior to today, users were unable to activate the Uber ride booking extension in iOS Settings, meaning the service was unavailable when navigating in Apple Maps. Siri integration was also bugged. Users attempting to book an Uber through Apple's voice assistant were met with an error message saying, "I wish I could, but Uber hasn't set that up with me yet." The issue was determined to be an Uber-specific problem, as iOS system integrations with ride sharing competitor Lyft and other services functioned as expected. When installing the latest update, users should instantly see Uber's ride sharing extension appear in Settings > Maps. The screenshots above reflect the change. 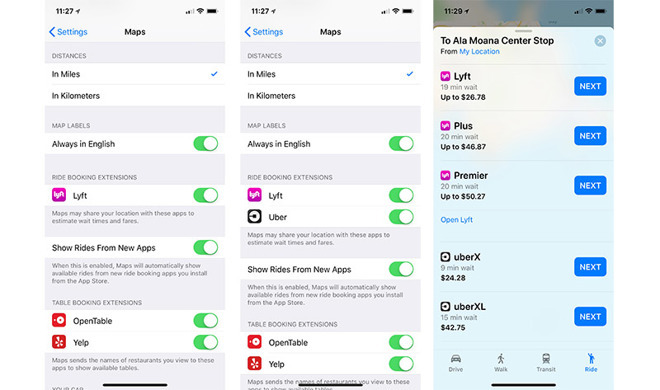 The capture on the left displays Uber's last version without support for Maps extensibility, while the center image shows the app's return immediately after installing today's update. Similarly, users can once again ask Siri to book an Uber. Uber is a free 265.7MB download from the iOS App Store.